Explanation: On some nights it rains meteors. Peaking over the next two nights, asteroid dust is expected to rain down on Earth during the annual Geminids meteor shower. This year, unfortunately, fainter Geminids will be harder to see because of the brightness of the Long Nights Full Moon, which occurs Wednesday. 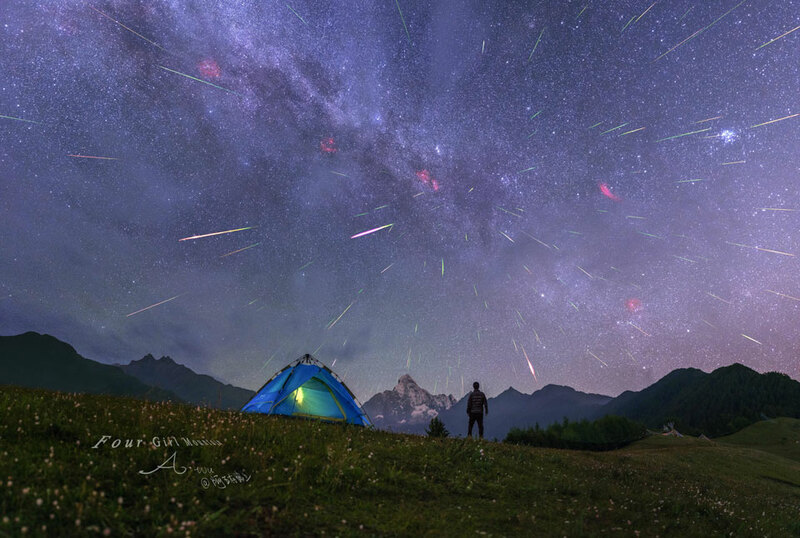 Pictured, an image from this year's Perseids meteor shower in August captured multiple streaks over Four Girls Mountain in central China. The bright Pleaides open star cluster appears toward the upper right, while numerous emission nebulas are visible in red, many superposed on the diagonal band of the Milky Way.